We have a new door hanger/wreath!! I particpated in Gina's Supply Swap. I got lucky and had a super amazing blog swap partner, Kate from Bookworm to Bombshell!! Kate sent me an "M" and fabric rosettes. I painted the "M" she sent, used all her fabric flowers, added one of my own to tie in the green and done!! I LOVE the scrabble letters, can't wait to find a craft for those!! I was also really excited about the set of stickers of places in Europe since my big sister is about to move there, so many fun things could be done with those!! Not to mention everything else, what a fab girl!!! And then, as if it could get any better, she sends a second gift!! I'm telling you people, you want this girl as your swap partner!!! She's the bee's knees, cat's pajamas, all of the above!! See the one that's on the top row, far right?!? It's the clear envelope with the white label, teal colored tape and red stamps. If you don't remember what it looks like you can check it out in this post. I'm pretty excited about the whole thing. 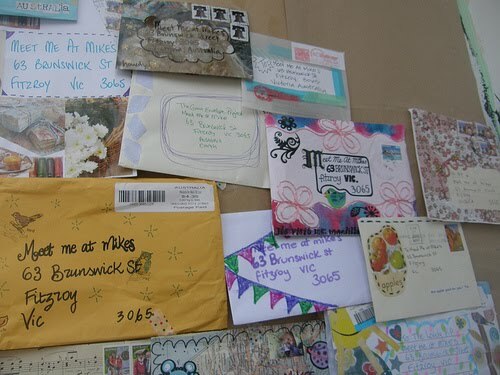 Seeing all the envelopes they've gotten, there isn't much of a chance I will win, but it's still super fun to see something I made on display somewhere. That's all for now, xoxo, clm.